If you want to feel like a superhero in your kitchen by cooking an entire meal in less than 30 minutes, this Instant Pot cube steak will do just that! Channel your inner Thor by strapping on your red cape / apron, pound out your steak and create tender bites of meat smothered in a creamy mushroom sauce. A total winner. 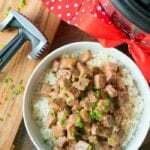 Pound your eye of round steak with a meat tenderizer/mallet on both sides (helps make meat tender, can buy it at store already tenderized too). Fill a gallon size storage bag with flour, garlic salt and pepper. Shake to combine. Set Instant Pot to saute medium and add olive oil. Put steak pieces inside baggie, zip closed and shake to coat pieces. When Instant Pot is hot use your fingers to take pieces of floured meat out of bag shaking off excess flour before putting it into the pot. Stir meat often and cook all pieces until they are lightly browned on both sides, then turn pot OFF/Cancel button - Important step! In a bowl whisk together cream of mushroom, mushroom gravy packet and beef broth. Use a wooden spoon to scrape the bottom of the Instant Pot where the beef has been cooked to remove pieces (helps so it doesn't come up with a burn message when you turn it back on, I typically wait 3-4 minutes after turning it off before turning it back on again to allow it to cool as well to avoid this message). Pour soup mixture into your pot, stir together gently, put lid on, and close steam valve. Set to pressure high for 4 minutes.